On 21 September 2013, one of Ghana’s illustrious poets, Kofi Awoonor, was shot dead by gunmen of the Al-Shabaab terrorist group at the Westgate Shopping Mall. He was in Nairobi, attending Kenya’s biggest book festival, the Storymoja Festival. He was a father, an academic, a diplomat and a poet, with a practice of more than fifty years. A few days before his death, he held an advance copy of the book that was to become his last, The Promise of Hope: New and Selected Poems, 1964–2013, and was said to have remarked on its beauty. The beauty of this testament of letters, The Promise of Hope, is that it offers the most concise presentation of Awoonor’s oeuvre. Awoonor – with contemporaries like Wole Soyinka, J P Clark and Christopher Okigbo, a generation of British-educated Africans who rose to take up the mantle of independence – was one of the early modern African poets who came after those described by Donatus Nwoga as pioneer poets, the likes of Gladys May Casely-Hayford and Dennis Chukwude Osadebay. Nwoga notes that Awoonor and his contemporaries exhibit ‘greater complexity’, ‘greater freedom with syntax, word meanings and symbolism’ than the pioneers whom they succeeded. Awoonor loved to dance and was in his youth the life of the party. But he was also an introspective man who worked with words. More than being a poet, he was the consummate writer: an essayist with a book of literary criticism (The Breast of the Earth) and a novelist (This Earth, My Brother). However, his poetic output outweighs all other types, coming up to seven volumes, beginning with Rediscovery and Other Poems (1964) and culminating in Herding the Lost Lambs (2013). It is from these volumes that his friend, Kofi Anyidoho, a notable poet in his own right, made a collection of new and selected poems, spanning half a century of meritorious practice and poetry fervently produced over the course of an active life of extra-literary engagement, political involvement and diplomatic activity. Kofi Awoonor was a man of many parts. But before he came to be known as Kofi Awoonor, he was first known as George Awoonor Williams. However, that name was destined to be changed because Awoonor, in his rediscovery of self, would come to reject the identity he had accepted on account of his colonial upbringing. The best way into The Promise of Hope might be to enter the book with the back, taking a cue from a line in Awoonor’s early verse, ‘My God of Songs Was Ill’, where we read, ‘come in with your backside’. The Promise of Hope begins in reverse chronological order, offering selections from Herding the Lost Lambs (2013) first and Rediscovery and Other Poems (1964) last. However, it is most rewarding to begin with Awoonor’s poetic first fruit, which dwells on a bucolic childhood, similar to his contemporary, Seamus Heaney, whose poetry is also suffused with picturesque and fertile depictions of farm life and landscapes. Awoonor, son of a tailor father, originally from Sierra Leone, and a Togolese mother, was born in Wheta, a small farming village, and ‘baptized into the Presbyterian church’. His childhood is a landscape dominated by fresh water, teeming with wildlife, described with a vitality that calls to mind similarly nostalgic depictions in G ‘Ebinyo Ogbowei’s Marsh Boy and Other Poems. From childhood, like his peers, Awoonor grappled with the ambidextrous challenge of both western and indigenous technology, culture and religion. He had to combine going to school as a young lad with the indigenous knowledge systems of the small, agrarian town into which he was born and lived, combine being a baptized Christian with observing ritualistic proceedings at the ancestral thunder shrine. Little wonder his early poetry obsesses about the notion of identity. 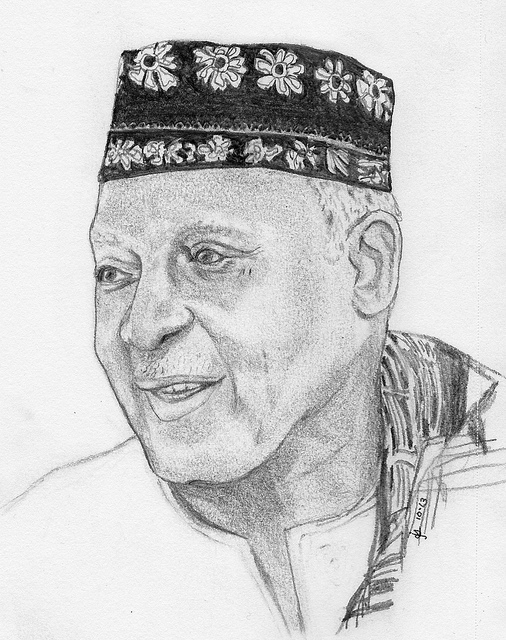 In a 1967 conversation with Robert Serumaga, Awoonor asked rhetorically, ‘The new African is caught up in the world of Europe…what is he going to about the wisdoms of his fathers?’ With the benefit of hindsight, it becomes clear that Awoonor did plenty with that wisdom, working fervently as a poet whose poetics never strayed too far from orature. Awoonor’s poems, especially the earlier work that is more allegorical than not, grappled with his father’s gods, fishermen, seagulls, chameleon faeces and weaver birds. In ‘The Weaver Bird’, his metaphor for colonial presence, he describes the destructive nature of the encounter between western and indigenous African culture. Unsurprisingly, his was not the only art that was preoccupied with the conflict: his peers, Achebe, Clark, Soyinka, through various forms of art were also probing and prodding this socio-cultural situation. When he was asked about how he saw the African society transforming under these circumstances, his response was: ‘The whole question of economic organizations and social organizations, or political institutions has really come to show that we have not had our education properly in terms of what we are trying to do; we have become black Europeans’. And, this yet again might be a self-portrait redolent of the young Awoonor, who wore sport jackets, ties and kept a trimmed beard and a fluffy afro. The young poet was precocious enough to have published his first collection as an undergraduate. That poetry was, at the same time, ponderous, elegiac and movingly lyrical. It read very much like work translated from another language and culture, with deep contemplation and nuance, characteristics that his 1971 collection, Night of My Blood, also shares. This early style is best exemplified in his long poem, ‘I Heard a Bird Cry’. Kofi Anyidoho avers, in his lengthy introduction, the troubled place that The House by the Sea occupies in Awoonor’s oeuvre, crowning it ‘the most challenging to read, to fully digest without a lingering sense of discomfort’. However, in Latin American and Caribbean Notebook, Awoonor’s poetics ease away from the apprehensions that accompany political struggle and living in America. The poems of Latin American and Caribbean Notebook were written mostly during his time as a Ghanaian diplomat in Brazil and then Cuba. Like Ride Me, Memory, his poetry is both visual and personal. He finds himself at home in these new climes and, to borrow Anyidoho’s words, they felt like ‘replicas of ancestral grounds filled with memories of historical injustices and monuments of struggle’. Awoonor in his poem ‘Of Niggerhood’ says, ‘Memory told me I’d been here before/ once upon an age’. And in ‘Havana, Cuba’, ‘I walked Havana/ searching for the men of my village’. Herding the Lost Lambs, Awoonor’s final, stand-alone volume of poems, brings all aspects of his poetics together. The voice is a nuanced and self-referential one, with the texture of language in translation. The proverbial tone returns but now the poet speaks with authority, like when he says, ‘where the worm eats/ a grain grows’, or when he prays, ‘benevolent fathers/ when we forget the loins from which we came/ nudge us back into the river’. By far Awoonor’s most exuberant poem of this final period is ‘The New Boy on the Block’, presumably written for his last son and definitely a moving ode to fatherhood in ‘the falling years/ when leisure is less than planned/ and romance blooms in the eyes/ of a lovely woman’. Awoonor was 78 years old when death, which he had personified as a man, came to drop its ‘inimitable calling card’. However if he had been warned not to go to the Westgate Shopping Mall, he would have been adamant, for as he writes in ‘A Death Foretold’, from Latin American and Caribbean Notebook, he believes ‘in the possibility of freedom’ and ‘in death’. There is no doubt that Kofi Awoonor is writing poems chastising death in the afterlife.